This article is meant to provide you with details in generating Custom Fields within Activity Types and Report Types. If you have a question not addressed here, you can search at the bottom of this article in Related Topics or you can Contact Support. Custom Fields allow you to collect and track additional pieces of information specific to an Activity Type or Report Type. For example, when a Phone Call Activity is recorded – you may want to track the subject of that call. When a Monthly Medication Log is recorded – you may want to track the corresponding month and year. From an Activity Type or Report Type, click on the Custom tab to access the Custom Fields screen. • You can create up to 10 custom fields for an Activity Type or Report Type. • Configure the Custom Fields from top to bottom; one per row. 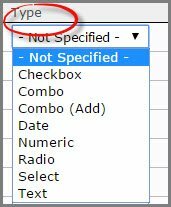 Leave any unused custom fields as “Not-Specified”. • NOTE: When adding/changing/removing custom fields for an existing Activity or Report Type, your modification will affect ALL activities and reports associated with that Activity or Report Type. Existing custom field values/data could be affected (modified or deleted) by your changes. If you are making significant changes to a custom field – it may be preferable to create a new Activity Type/Report Type versus modifying the existing one. For example if you already have and use a report type called “User Satisfaction Survey” which has 10 questions and answers in the custom field, modifying the questions and answers would affect all existing surveys. It may be preferable to mark the existing Report Type as inactive (preventing new ones from being created, which retaining old ones). Tab Order: Determines where the cursor will go next, when a user clicks “Tab” in a Custom Field. Row: : Fill out fields row-by-rowe (left-to-right; top-to-bottom). Column: Fill out fields in 1st column; then 2nd column. Label: Name of the Custom Field. Not Specified: Custom Field not in use. Checkbox: Pick one or more values from a list. Combo: Pick only one value from a list. Combo (Add): Pick only one value from a list or type a value. Numeric: Number field (cannot be currency). Radio: Display all field values at the same time (similar to check boxes)- however only one value can be selected. Select: Pick multiple values from a list (can use type-ahead). Text: Type in any value. Req. 1: Indicates if a field is required to be filled-in. Desc. 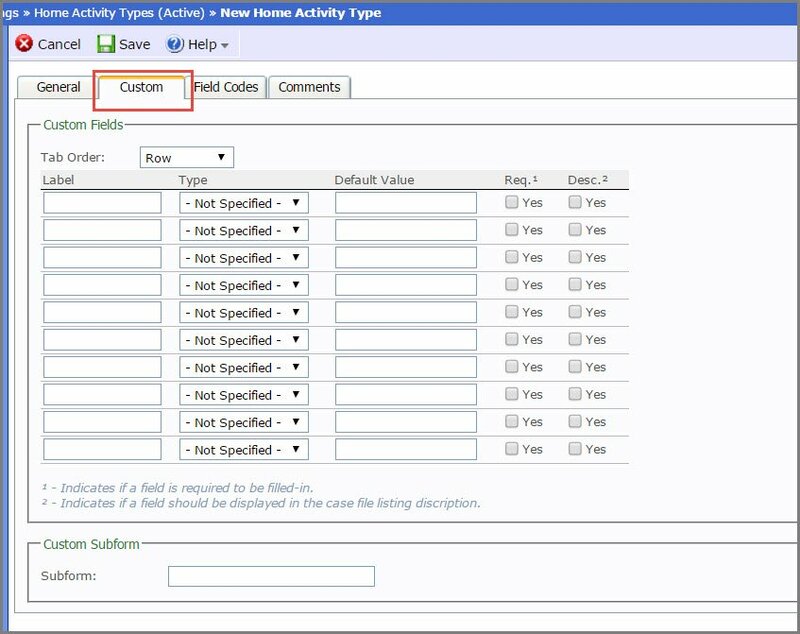 2: Indicates if a field should be displayed in the case file listing description.